Naveen Jain is leading disruptions today that will reshape the world—and beyond. From redefining civilian space exploration to creating a path to free energy to disrupting healthcare and education, Jain is at the forefront of the exponential technology developments that will forever change how we live and work. In Moonshots Jain reveals the secrets of the "super entrepreneur" mindset—the catalyst for creating an exciting and abundant future. He then walks readers through the application of these powerful concepts in three moonshot initiatives that he is leading today, one of which is Moon Express, a private lunar venture that promises to open up the moon's vast resources for the betterment of humanity. In Jain's world, the term "moonshot" is meant both literally and figuratively! Journey with Jain through these illuminating pages and awaken your own moonshot potential. It’s a discovery that will change your life—and quite possibly the world. The book cover includes interactive augmented reality features. Naveen Jain is the Chairman and founder of Moon Express, the founder of inome, Intelius, TalentWise, InfoSpace, and Viome. Together, his experiences tell the story of a man who, with hard work, creativity, and "a little luck and good timing," became a multi-award-winning top entrepreneur whose passion lies in creating successful business ventures for the good of all. Jain is a trustee of the board at the XPRIZE Foundation, a director of the board of Singularity University, and serves as a director on the board of several startup companies. His awards and honors range from the "Albert Einstein Technology Medal" to being named one of the "Six People Who Will Change the Internet" to leading a business that earned a place on the Puget Sound Business Journal’s "Top Three Best Workplaces" list. Jain's wife and children share his commitment to improving the lives of others through philanthropic activities centered around innovation, education, and positive youth development. John Schroeter is publisher of the iconic Popular Electronics, Mechanix Illustrated, and Popular Astronomy magazines at TechnicaCuriosa.com, as well as Executive Director at www.TheStartupStudy.com. His deep industry experience spans semiconductors to high-performance computing to advanced automotive technologies. His patented work in eliminating counterfeit drugs from the supply chain was recognized with Frost & Sullivan's Technology Innovation Award. He continues to write consult in the advanced semiconductor and high-performance computing fields, with an emphasis on machine learning applications in defense and healthcare. Schroeter is also the author of several books, including the Prentice Hall classic, Surviving the ASIC Experience, on the design of custom integrated circuits. In this debut book, an entrepreneur views intellectual capital as securing the world’s future. Jain’s enthusiasm for the entrepreneurial mindset permeates a potent volume that is both a futuristic look at innovation and a recipe of sorts for success. Part One of this elegantly written treatise deeply explores in the broadest possible terms the thought process of the entrepreneur. The author makes a solid case for the entrepreneur as an imaginative visionary. Jain, a serial entrepreneur, celebrates in particular those magnates who take “moonshots,” or reach for the impossible. He believes they “will emerge as leaders of the new world order,” a bold if not wildly audacious prediction. Equally daring are some of Jain’s educated guesses as to where entrepreneurial thinking will take readers in 30 to 50 years, examples intended to demonstrate exciting possibilities rather than accurately predict the future. The author waxes poetic about intellectual curiosity, motivation, perception, and wisdom, but none more important than imagination—all elements embodied in the moonshot entrepreneur. Parts Two and Three of the book are shorter but no less enticing. Part Two concentrates specifically on health care and education, two areas in which Jain thinks moonshots are sorely needed. Here, his pertinent illustrations are creative, stimulating, and thought-provoking; for example, his idea to “make illness ‘optional’ ” is discussed in the context of Viome, a company he founded, which works in the microbiome space. Part Three is an exhortation for entrepreneurs to have “an openness to radical possibility” and to strive for moonshots, with some helpful advice for how to do so. “As long as you continue to learn,” advises the author, “you never really fail.” The “ten takeaways” offered at the end of Jain’s volume—written with Schroeter (Between the Strings, 2004, etc. )— encapsulate his thoughtful counsel. The prose conveys breathless, almost soaring optimism; the book exudes an infectious passion for the role of the disruptive entrepreneur in meeting the world’s challenges. There is so much genuine wisdom in this work that it is hard not to come away impressed with the breadth and depth of Jain’s insights. An exuberant, mind-expanding, and at times enthralling call for inventive entrepreneurs. 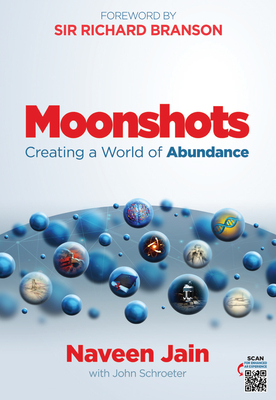 Moonshots: Creating a World of Abundance comes from a billionaire entrepreneur who focuses on the types of disruptive innovations that can not only change human life, but improve it in various ways. It chronicles an approach to not just accepting this change, but cultivating its presence in everyday life. The term "moonshot" in Naveen Jain's lingo is designed to be a one-word summation of the "super-entrepreneur" approach to innovation, which can be applied beyond business pursuits to technological advancements and everyday life. Jain holds a specific idea of abundance that holds strong roots in lofty ideals ("This convergence—unprecedented in human history—will upend every notion we have about our civilization: how we live, where we live, how we work, how we get around, how we interact, even what we are. And all of these outcomes will be realized by the ushering in of a previously unknown kind of economy—an economy of abundance. An economy whose very basis lies in sharp contrast to everything that’s being peddled to and simply taken for granted by a naïve public. "), pairing these visions with practical insights on how these approaches can be incorporated into everyday choices. From Flatland discussions to Dostoevsky, philosophy, and the roots of entrepreneurial thinking, Jain encourages the idea that bigger-picture thinking needn't come from a foundation of expertise alone: "I am not a rocket scientist, but that didn’t keep me from founding Moon Express. Or Viome, with no credentials or training whatsoever in physiology, genetics, or healthcare. My status as a nonexpert has actually been my greatest asset as an entrepreneur. This is why I have never started two companies in the same industry, ever...Every company I have started was not only in a different industry from the last, but an industry that was completely new to me. My belief is that once you become competent in a particular domain, you can only improve it incrementally—you can never disrupt it. Disruption happens when someone who has no idea about your industry begins to challenge the very foundations of everything that the experts have taken for granted." Thinking investors and entrepreneurs who want to move outside the box will find much encouragement in Jain's 'moonshot' approach, which supports the reason why the process is so accessible to non-technical readers: "Moonshots are possible only because audacious entrepreneurs are able to look at a problem from a perspective that the experts have never considered. Thinking in the abstract is something the industry expert can no longer do." Much is involved in cultivating this approach. It should be cautioned that Moonshots is not a get-rich-quick scheme or blueprint for quick action, but a read to be digested slowly, savored over a period of time, and approached with the respect for complexity that it deserves. Would-be entrepreneurs, investors, and individuals vested in bigger-scale perceptions of life's possibilities will find Moonshots a detailed survey not just of Jain's processes and success, but the types of thinking on disruptive innovation that lead to success on many different levels. Moonshots should be in any collection strong in business, ideology, self-help, philosophy or technology. It's a highly recommended, decidedly hopeful probe of mankind's next possible stage of self-driven innovation and evolution.